Such a cute watch! Its large face is super-stylish and pairs well with dress, business, or just jeans. The band is soft and comfy, breaks in quickly. For fellow Disney fans, this is a must-have! Add a bit of appeal and sophistication to your look with this charming watch, crafted from stainless steel. 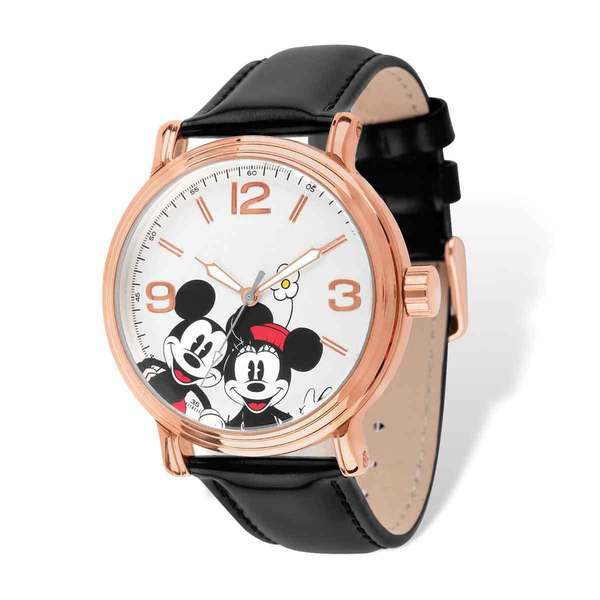 From Disney collection, the attractive watch features a timeless Mickey Mouse design, beautifully enhanced by the black strap. With stick hands, accurate Japanese quartz movement, and a water resistance of 3 ATM, this elegant watch is a great choice for women on the go. True fan of Disney ! I love rose gold, how is it possible I could even find this watch !? Very happy with the design, rose gold color and the strap. Have received many compliments even from children ! Love wearing this piece. Nice watch, designed well, however, I was not expecting the face to be so large. The face of the watch is sized for a man's wrist.